Herbs don't need to be grown in a garden of their own. You can tuck herb plants anywhere in your existing beds and borders. However, there are times you will want to have certain herbs handy for harvesting or you'll need a large space to plant the herbs you will be using in large quantities. But a designated herb garden is a luxury for all the senses and working in an herb garden is as much pleasure as it is toil. Here are some tips for creating an herb garden to enjoy. Pick a sunny spot, but try to keep your herb garden near the kitchen, so you'll be tempted to step outside and grab what you need while cooking. Of course, if you're growing herbs other than for culinary use or if you're growing large batches of herbs to preserve or dry at the end of the season, kitchen proximity may not be a concern. How Large Should Your Herb Garden Be? The obvious answer is, large enough to grow all the plants you want or need. Culinary herbs don't take a great deal of space. Because you cut only what you need and most will regrow new leaves within weeks, a couple of plants can suffice for the season. The question of space is more dependant on how much variety you want and how many of the herbs are perennial. 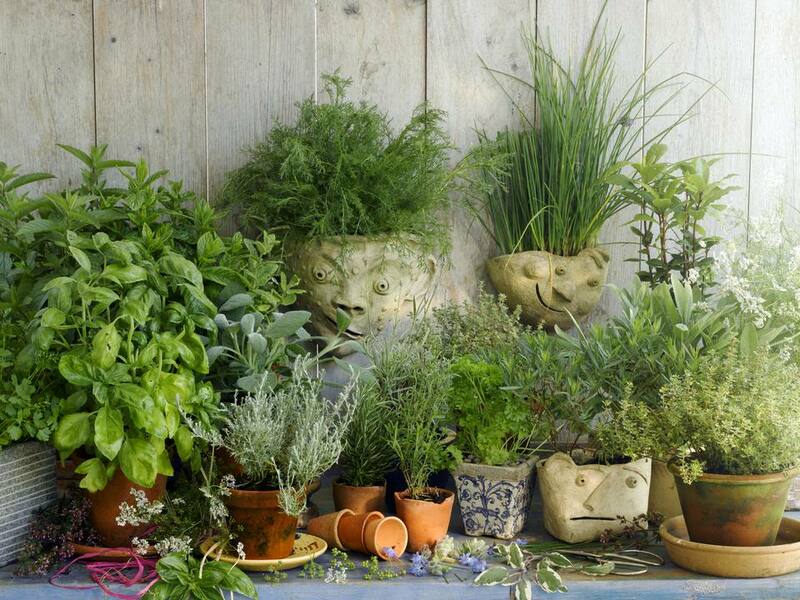 However, if you are growing to dry or freeze herbs, you will want more plants. And if you are growing for some other purpose, such as making dyes or potpourri, you will need very large plantings. A final consideration is whether you will be devoting an entire garden to herbs or interplanting them with other plants in your existing gardens. Formal herb gardens look gorgeous - at least during their peak season of May through June. The structure of the garden helps to cover the straggly appearance of overgrown, recently sheared or bolting herbs. All of these stages will appear at some point during the growing season. Generally, formal herb gardens are laid out as a series of beds creating some geometric form, like a square, circle or half-circle. The plants will vary in each bed, but the geometry of the hardscaping pulls things together as a whole. Paths between the beds are often paved with stone or brick, adding even more four-season structure to the picture. Add a central feature, like a sundial, urn or birdbath, and you have a garden that will look polished even when the plants are covered in snow. Theme gardens are popular with herb gardeners. Themes such as color, scent or variations of a particular herb can easily be incorporated into the separate beds. Some gardeners prefer to group perennial herbs separate from the annual herbs. Just like in the flower garden, the perennials will spread and develop over time. You can fill in open spaces with annual herbs, but you don't want to be disturbing the soil around them every time you start new annual plants. And if you allow the annual herbs to self-seed, you are going to have some editing to do, once the perennial herbs start to fill in. Annual herbs, kept in their own section of the garden, can be varied every year and also planted in succession through the summer. The idea of a windowsill herb garden is very alluring for both chefs and gardeners. While it is possible to grow herbs well in pots indoors, it's not as easy as it may appear. Remember that herbs need a great deal of sun to grow well. Windows, particularly in winter, can't always provide as much sun as is needed. And while herbs like well-drained soil, they are not that fond of the dry air conditions of centrally heated homes. Probably the biggest drawback to herb gardening on a windowsill is that most herbs will require at least a 12-inch pot. The tiny potted herbs lined up for photo shoots aren't terribly practical for cooking purposes unless you only plan to harvest once a month or so. That said, you will still enjoy having potted herbs near me in the kitchen, if only for ambiance and inspiration. The real thrill of culinary herb gardening comes in the summer when you can harvest basil, dill, and whatnot by the arm full. Some herbs are well suited to growing in the vegetable garden, where they can be harvested as needed and their self-seeding might even be welcome. Annual herbs like basil, cilantro, and dill are more convenient if they are near the vegetables they will be cooked with. Some herbs are so attractive they deserve a place in the flower garden and can be a key element of garden design. Certainly lavender would be welcome in any spot in the garden. Plants like monarda and calendula are so little used as herbs these days, we just consider them ornamental flowers. And even culinary herbs, like dill and borage, look at home in a cottage style garden where they can self-seed with abandon. A great bonus to inter-planting your herbs in the vegetable or flower garden is that many herbs attract beneficial insects to the garden. This can help in overall pest control, however, you may be sacrificing some of the herb plants.